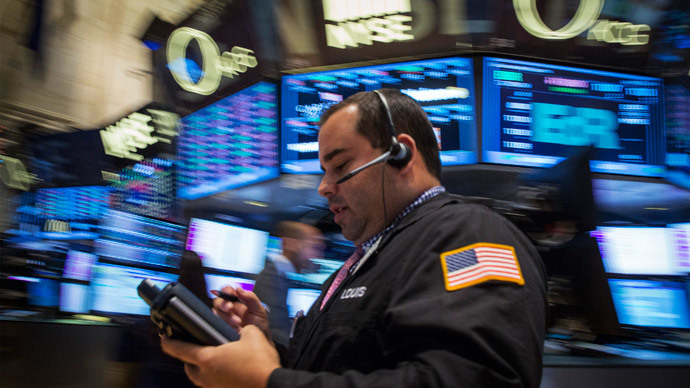 The Dow Jones Industrial Average has lost over 300 points as crude oil prices briefly dipped below $50 per barrel thrashing energy stocks on Monday. As of 1:21 pm ET the Dow fell by 1.82 percent losing 323 points. The Standard & Poor’s 500 Index followed close behind 1.55 percent off losing over 36 points at 1:11 pm ET. The US stock markets fell as crude oil futures prices dropped to their lowest since mid-2009 on the New York Mercantile Exchange (NYMEX) on Monday. West Texas Intermediate (WTI) February futures fell by nearly 5 percent briefly dipping below $50 a barrel. Brent crude hit its multi-year low dropping at one point to $52.90 a barrel as it’s February futures fell by over 6 percent. Meanwhile the US officials say they believe the drop in oil prices has so far been beneficial for the American economy. Earlier on Monday, the European benchmark for Brent oil dropped to $54.72 a barrel on the ICE Futures Europe exchange in London, Bloomberg reported. February futures slid as much as 2.8 percent extending a loss of 5.1 percent since last week. By the end of 2014 Brent futures fell by 48 percent over the year. Monday’s opening session of the new year continued the disappointing decline. The slumping oil prices come amid slackened global demand while supplies still remain high. "There's no doubt that we have a combination of supplies hitting their zenith at a time when demand is weakening," Phil Flynn, analyst at Price Futures Group in Chicago told Reuters. Oil production in Russia and Iraq surged to the highest level in decades. The Iraqi Oil Ministry said on Sunday that it plans to increase crude exports to a record in January. Russian oil production rose 0.7 percent in 2014 and averaged 10.58 million barrels a day, which set a post-Soviet record. The euro was also hit on Monday tumbling to new lows against the dollar. The currency fell to $1.1861, its weakest level since 2006 during Asian trading hours, however picked up slightly to trade at $1.1950 during European ones. Richard Peterson, senior director at S&P Capital IQ told MarketWatch that there will be volatility on the market for some time adding that he remains optimistic in the long-term. “Markets are more on a pause than retreat as concerns over euro and oil have taken over fundamentals for now,” he said.” We still expect 11% fourth-quarter earnings growth for the S&P 500 companies excluding energy sector, which will drive markets higher,” Peterson added.